In a broad sense, solving a problem can be treated as deciding or making a decision what the solution to this problem is. In particular, decision-making with respect to a question means finding an answer to the question. Thus, solution of any problem can be treated as decision-making. However, traditionally decision-making is understood as making a choice from a set of alternatives, which are usually alternatives of actions. Here we consider decision-making in the traditional form exploring the role and features of information in this process. In section “The Process of Decision-Making”, we consider existing models and elaborate a more detailed model of decision-making. In section “Properties of Information and Their Evaluation”, we demonstrate that each stage and each step of decision-making involve work with information—information search, acquisition, processing, evaluation, and application. Evaluation of information is especially important for decision-making because utilization of false or incorrect information can result in wrong and even disastrous decisions. 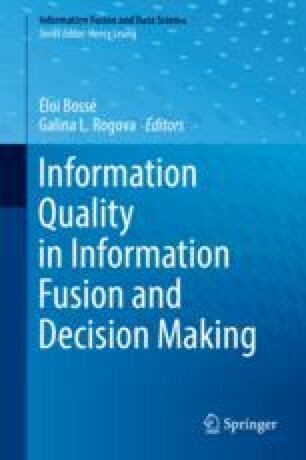 We show how to evaluate quality of information in the context of decision-making, what properties are important for information quality, and what measures can be useful for information evaluation. The obtained results are aimed at improving quality of information in decision-making by people and development of better computer decision support systems and expert systems. The author would like to express gratitude to Éloi Bossé for his useful remarks.